Today was super duper chilly, and gray....We could either have acted like chilly slugs and not have moved a muscle (except for work), or we could embrace it and pretend that walks in the park on chilly wet days are our absolute favorite thing ever!! We chose the latter! The park was actually full!! Families in their favorite hoodies, happy dogs, joggers and runners young and old....and a woman Aaron and I nicknamed the "bird whisperer" were all enjoying their saturday. We decided to do the whole cross country course 3.2 miles. I know I already said it the other day...but my gosh!! Those kids amaze me!! There were the "long legged Princetonesque blonde mop top" boys...and the "Laguna beach" looking girls....but my goodness.....there were some surprises crossing that finish line as well!! Some were let's just say, "less than thin", and "anything but built for running". I give them sooo much credit!! Really, If I had a pull-string in my back that day.....my repeating phrase would have been...."God Blessem" as each crossed the finish line! Which reminds me of my Mork from Ork doll that I had when I was little!! Oh my gosh!!.... (it said Shazzbot, and I am Mork from Ork Nanu Nanu....nuts huh?) However you spell Shazzbot! Anyways....nice day at the park...glad to get out...although the mosquitos found us...me mostly....incase you don't know..I'm almost positive that I am the most delicious thing in New Jersey to those things! We finished some new art squared....after a bunch of requests for a pink cupcake, it is now available!! 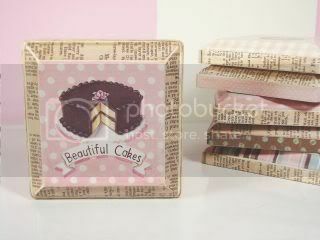 My favorite is the mini "beautiful cakes",the tiny banner..polka dots...vintage baking book edging...and pink and cream stripes on the sides.....sweet! all are now listed in our eBAYstore. Today was Alicia's, of Posie Gets Cozy fame, 1 year Blogiversary!! It is the most amazing blog ever! She is beyond inspiring!! I truly urge you to check out her blog if you haven't already...take a whole weekend and go through her archives...I tell you..it is better than any magazine or book!! Such a fabulous world! Her words as well as photos knock my socks off!! Happy Blogiversary Alicia!! Thank you for the daily eye candy and inspiration! !